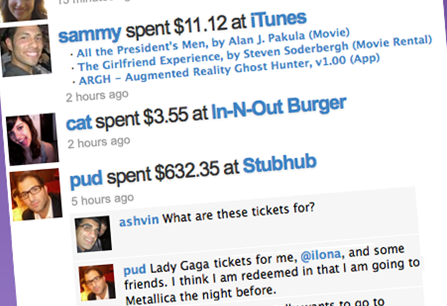 How far can social networking go, how about into your wallet? Blippy makes credit card transactions social. I was reading a recent article about Blippy and I was floored by this next level of social networking. The website asks, “What are your friends buying?” Register for an account, enter your credit card info (which is not kept on record) and share with the world what you are buying. Your Blippy account is updated with what you just bought. Other Blippy users can comment on your purchase. You can tell Blippy what types of transactions you don’t want to go public. It also has a connection with Facebook and Twitter. As a by-stander, I think this website is cool. Now I can see what other people are buying and if I see something nice, I might buy the same thing. All I can say is that a recent poll stated 70% of lawyers are using social networking in case proceedings. Use this service at your own risk. Do you think Blippy is too much information? ← Google Buzz Wearing Off?